DesaMuda Village is located in the center of Seminyak Legian Kuta Bali and is 15 minutes from airport, close to restaurants and shops, yet miles away in a private setting, the perfect hideaway. 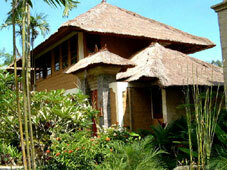 The cozy arrangement of twenty villas in Desamuda is designed in Modern Balinese style with 'Alang-Alang' roof. Nestled among luscious tropical gardens, each villa offers you a feeling of being home away from home. Even the birds and squirrels around here choose to reside in our trees. And when you step out of your villa door, you can still call it home for we provide a safe and friendly environment for you and your children. Desamuda is suitable for both short and long stay. Each villa is private and self-contained so either you want to get away from the bustling crowds or on a business trip, we have what it takes to keep the smile on your face. 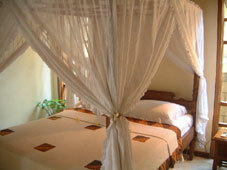 The spacious air-conditioned studio villa is appointed with a Balinese-style double bed to give you the best comfort. Living room and fully-equipped kitchen are the standards of this studio. There are two types, first the bedrooms are located on the first and second floor. Another type is The two bedrooms are on second floor and leave only living room on the first floor. The villa has same arrangement as the Two Bedroom Villa with an additional bedroom on the second floor, but each offers more peace and privacy in its a private swimming pool set in the back garden with a patio, a cool place to hang out and chat, or just to simply have a cup of coffee in the afternoon romantic setting.